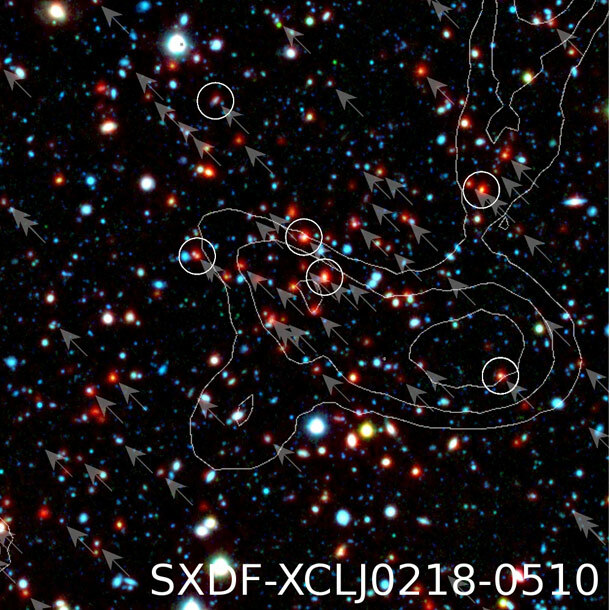 Astronomers have found the most distant galaxy cluster ever seen: the sexily-named SXDF-XCLJ0218-0510. Yikes! What’s all that then? Okay, first, this picture is littered with stars and galaxies. The galaxies are so far away they’re hard to distinguish from the stars! The dots that have arrows pointing to them are the galaxies that are most likely part of the cluster. The ones with circles have had their distance measured and are known to be part of the cluster for sure. The contour lines represent the detection of very hot gas, which is a dead giveaway that we’re dealing with a cluster here; all big clusters have gas swirling around them that gives off X-rays; the lines are like a topographic map telling you where the (otherwise invisible) gas is in the picture. “So what?”, you might say. We’ve seen lots of clusters before. Ah, but this one is different: it’s a whopping 9.6 billion light years away. Billion. With a B.Studying clusters is important because it tells us a lot about the environment in which galaxies form. When we’re trying to figure out the overall structure of the Universe — and it’s incredible to me that we can even think about doing such a thing — clusters are the single biggest component. Understanding them means understanding the Universe itself. But there’s more. Because clusters are so big and bright, they can be seen really far away. In space, distance means time; the farther away we see an object, the younger the Universe was when the light left that object. In the case of this newly found cluster, the light we see left it 9.6 billion years ago — making it 400 million light years farther away than the next-most distant cluster ever seen. The Universe itself is only 13.7 billion years old, so we’re seeing this structure as it was not too long after it formed. And that’s the key issue. Clusters are so big that they take quite a bit of time to form. But how long? We’re not sure. We’re not sure exactly how long galaxies take to be born either. So every time we see one farther away we push back the time it takes to form them. Think of it this way: if it takes, say, 5 billion years to form a cluster, then we wouldn’t see any more than 13.7 – 5 = 8.7 billion light years away. This one is 9.6 billion, so we know that clusters cannot take more than 13.7 – 9.6 = 4.1 billion years to form. In reality they probably take quite a bit less time. Observations like this one will help us understand just how much less. The reason this is important is because we don’t know the exact timeline of the Universe after the Big Bang. We know when it happened, and we know when the first stars formed, but it’s hard to say when the first galaxies and clusters of galaxies started to come together. Most likely that wasn’t a firm time, but it was spread out over hundreds of millions or billions of years. But the more we see, the better we can figure that out. As it happens, the colors of the galaxies in this image give a clue as to how old they are: young stars are blue, and old stars are red, so by looking carefully at the mix the age of the galaxies can be estimated. The galaxies in this cluster look like they formed around 11.5 billion years ago, making them already a couple of billion years old when they emitted the light we see in the picture. Another interesting thing: you can’t really tell from this image, but in the original data it looks like there are actually two clusters here at about the same distance. One of them has that hot gas, but the other is more indistinct and the detection of gas isn’t as strong. It’s entirely possible that this other cluster isn’t quite fully formed yet. If that’s so, then that means astronomers are able to detect clusters so far away that we can now actually see them forming. The more of those we find, the better our understanding will be of just how these enormous structures came to be. Looking at distant clusters also tells us about the early universe. You can’t build a skyscraper unless the ground can support it, and you can’t build a galaxy cluster unless the Universe has the right conditions for it. The Universe was different 10 billion years ago: smaller, denser, warmer. All of these are important parameters when you’re building something like a cluster. So by examining the edifice we can understand the environment it sits in. In this case, the building is a thousand galaxies each with a hundred billion suns, and the environment is the cosmos itself. It’s an architectural study written across the entire sky! And every detail gets us that much closer to understanding how everything — literally — came to be.